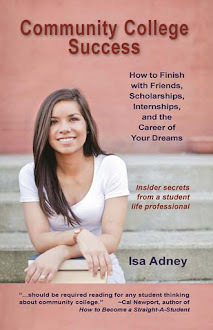 Community College Success: Ask Isa: "Honor or scam?" How do you know if an honor society is legit? Hi Isa! My boyfriend and I keep getting offers to apply for honor societies, but they come with an upfront fee. Are these worth it? They don't even look that competitive, the ones that we've been receiving only require a 3.0. Since you're the college expert, I thought you might know or have written an article about this subject. Thanks Isa! Sincerely, Honor or scam? 1) Bring the letter to a few trusted professors and get their input. Most legit honors societies are well known. If you get a letter for an honor society specific to your major (e.g. I got invited to Lambda Pi Eta, a communications honors society) be sure to ask a professor in that major. I had never heard of Lambda Pi Eta, but when I asked my communications professor about it she said it was a great thing to add to my resume, and she asked me to get involved because she was the chapter advisor; it was great. Professors live in the academic world and will often know what is recognized as an honor and what isn't worth your time and money. 2) Search the honor society online. Check their website, Facebook, Twitter, and LinkedIn group, and then do a Google search to see what people are saying. Don't take one complaint too seriously (as many people use the internet to complain more than to praise), but do take notice if a lot of people are saying it's a scam or if they thought joining wasn't worth it. The Association of College Honor's Societies also lists some great things to consider when looking online to see if an honor society is legitimate. 3) See if the honor society has a presence on campus. Another good sign is if the honor society has a chapter and meetings on your campus - that way you know it will be a chance to get involved. Though of course if you go to a very small college, the absence of a chapter may just be because no one has stepped up to lead - if the honor society checks out, consider starting a chapter on your campus! 4) Consider the benefits. Once you've determined the honor society is a good one (note: the ones I can 100% guarantee are looked upon as great honors are Phi Theta Kappa (2-year colleges) and Phi Beta Kappa (4-year colleges)), JUMP right in. You should be so proud of yourself for being recognized, and realize that good honor societies will add a great line to your resume, transfer applications, and scholarship applications. They can also provide opportunities to get involved. When I speak to community colleges my heart breaks when students come up to me afterwards and say "I got accepted to this thing called Phi Theta Kappa and I wasn't going to accept because of the money, but now that I heard you talk about it I'm definitely going to do it." Phi Theta Kappa was a HUGE benefit to my life; it offered me the opportunity to apply to tons of scholarships, helped me develop my leadership skills, made me eligible for a special transfer scholarship at my transfer university, and introduced me to lifelong friends and my first airplane ride. I know when you get this random letter with a price attached it's easy to be unsure. And for some of those letters, you should be skeptical. But there are some that you should be so proud of, and for which the money invested will give you a huge return, especially if you get involved in your local chapter. So basically what I'm trying to say is, join Phi Theta Kappa if you're accepted, and always ask trusted professors for advice in this area. P.S. To any current Phi Theta Kappa members: I will be at the international convention in San Jose, CA next week!!!! I'll be doing two ed sessions (check out the times in the agenda when you arrive), and when I'm not doing those you can find me in the Marketplace at the Pearson booth helping students tell their One Professor stories to get us to 500 videos so I'll get pied in the face live at convention! (If your chapter would like to get an early start on the chapter competition associated with One Professor, check out this video). If you get to Marketplace early you might just find yourself walking away with a free autographed book. If you've already bought my book be sure to bring it with you as I'd be happy to sign it for you while I'm there. I can't wait to see you!!! To ask me a question that I'll answer on the blog, go to the Ask Isa inbox to submit it anonymously.